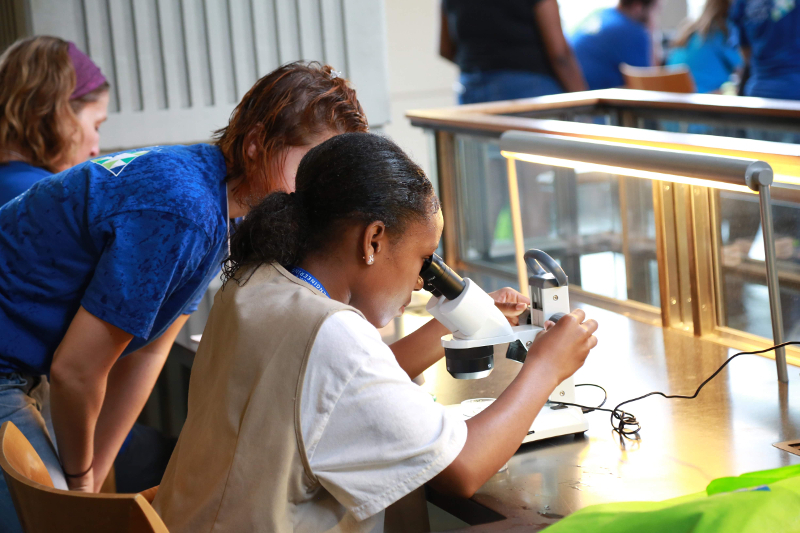 Reality inspired possibility at Duke Engineering for a day, as more than 100 girls descended on campus to build robots, learn forensic techniques and edit digital photographs taken with high-tech microscopes. Over 100 professional women (and a few men) in the fields of science, technology, engineering and math (STEM) from the Triangle region volunteered their time and expertise to mentor over 100 girls drawn from throughout the Triangle region for a day of interactive, engaging and fun STEM activities. 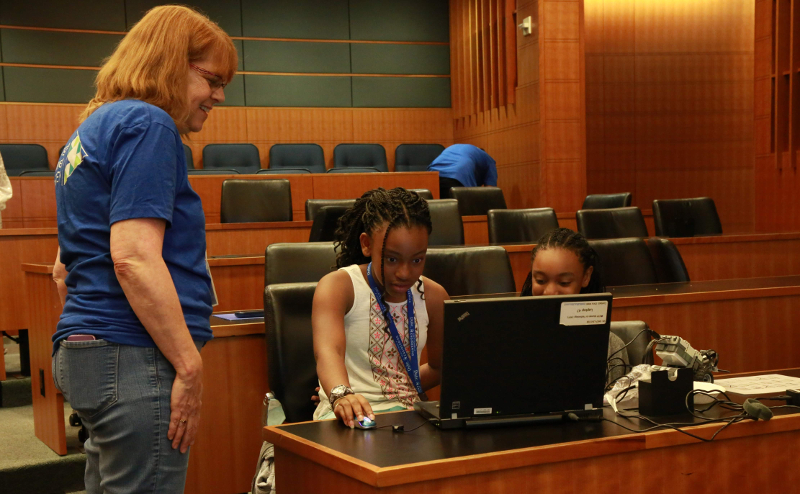 The event dubbed Girls STEM Day @ Duke took place on May 19 at the Fitzpatrick Center at Duke University's Pratt School of Engineering. 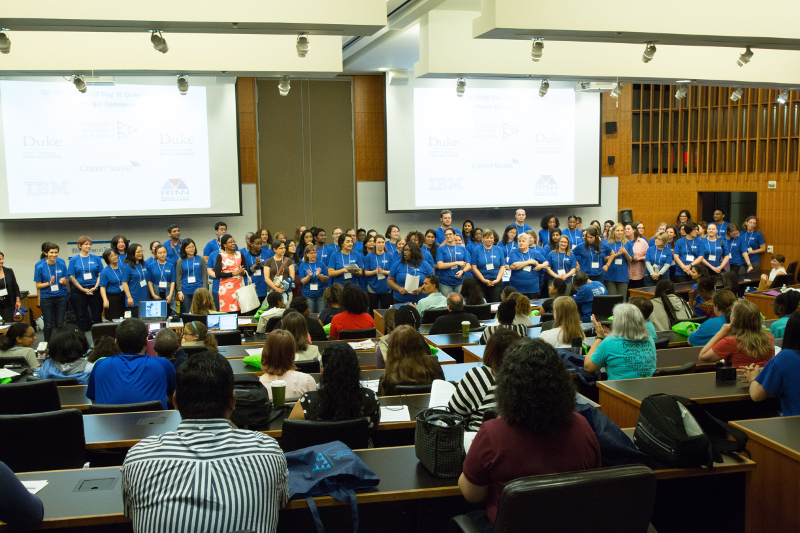 The goal of Girls STEM Day @ Duke was to demystify these fields for young women, and to create a pipeline to college and careers in STEM by sparking and, more importantly, sustaining interest in STEM education for both the girls and their parents. Their MO was simple - lead by example. According to Lisa Jones, chief executive officer at Girl Scouts, North Carolina, "By providing girls with hands-on STEM education and the opportunity to speak with female STEM professionals, we are inspiring them to become innovators and groundbreakers in STEM fields." "If you can't see it, it is hard to be it," said Sondra Rivers, a director in the Global Markets Technology Division at Credit Suisse and steering committee member of the Triangle Women in STEM (Tri WiSTEM), an initiative to make RTP the destination for professional women in STEM. 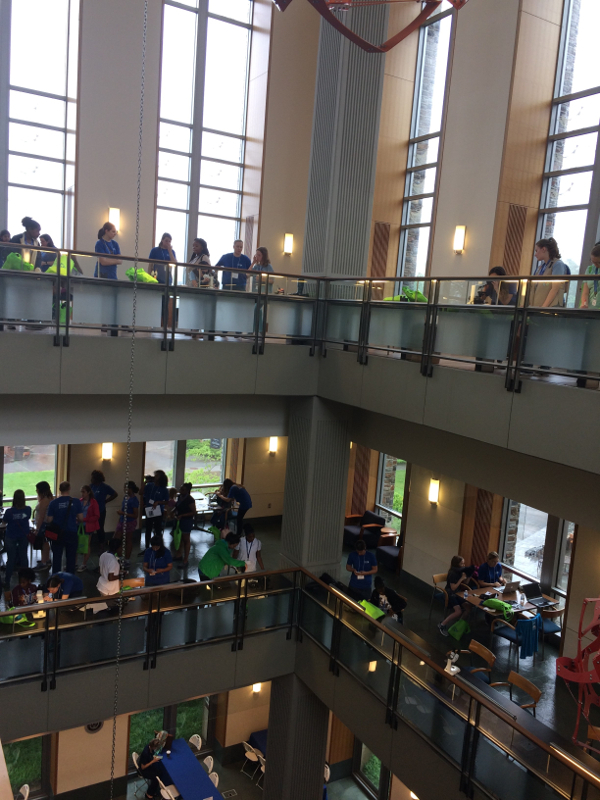 Girls STEM Day @ Duke gave middle and high school girls and girl scouts an opportunity to earn a STEM badge in forensic sciences, robotics or digital photography. The activities were inspired by the addition of 23 STEM-related badges by the Girls Scouts of the USA in 2017, and informed the activities led by Holly Leddy, research and development engineer at Duke in charge of the event's scientific component. A little Lego robot scurrying along a grid on the floor was just the thing that intrigued 14-year old Nahdia Benson of Raleigh to join the robotics badge workshop. Passionate about making robots "battle each other," Nahdia is encouraged by her mother, LaDonna Bonneville, a mechanical engineer, who advises parents to start their daughters with a fun, extracurricular activity in STEM and watch their enthusiasm grow. Accompanied by her team of IBM volunteers, Victoria Thio, senior software engineer manager, explained, "The girls had an opportunity to be a hardware engineer, a software engineer and a test engineer." A fictitious crime scene of "dog-napping" was created for the forensics badge in which the girls gathered evidence to catch the culprit. A ransom note was used to demonstrate ink chromatography, and a microscope helped them review fingerprints, hair and dirt samples from suspects. The digital photography workshop had the largest number of participants, who learned to use photo-editing software to digitally edit photographs taken with a cell phone, a light microscope and a scanning electron microscope in Duke's Shared Materials Instrumentation Facility, which is part of the Research Triangle Nanotechnology Network (RTNN). In a parallel parents forum, female STEM professionals, high school college counselors and university admissions counselors engaged parents and troop leaders in interactive panel discussions. In these sessions, the panelists shared their stories, related their career and educational experience, and imparted information. They also highlighted the types of STEM-related careers the girls could pursue and recommended coursework to prepare the students for an advanced STEM education. The panels also focused on simplifying the application process for college admissions and provided insight on what colleges are looking for in prospective students. The message to the girls is clear. "If you want high-paying jobs, you want to be the boss, and you want to do something interesting with your life, then study STEM topics and you can succeed. If I can do it, you can do it," said Nan Jokerst, professor of electrical and computer engineering and associate dean of strategic initiatives in the Duke Pratt School of Engineering. According to Jokerst, Girls STEM Day @ Duke was also a way to engage the Tri WiSTEM members, and brought volunteers from 30 private and public organizations in the Triangle. Erin Buckman from Credit Suisse, a former girl scout, volunteered to give back to the organization, and Ritu Mathur, a PhD in plant science and mother of two girls, volunteered to experience first hand how such events are excellent ways for girls to get excited about STEM. Another objective was to dispel feelings of isolation in girls who want to pursue STEM subjects. "By getting the girls together at this event, they get to see a hundred other girls like what they like, and they see an existence proof of what they can become through our volunteer role models," said Jokerst. The organizers are keenly aware that women are underrepresented in STEM fields. While women are 44 percent of the U.S. workforce, their share in STEM jobs is just 25 percent. This job sector, they also recognize, is poised for growth. The U.S. Bureau of Labor Statistics predicts that STEM-related jobs are projected to grow to 9 million between 2012 and 2022. This is precisely the economic opportunity that the organizers are encouraging women to seize. "STEM fields have the fastest growing and best-paid jobs," said Jokerst. Government statistics also show that professionals in STEM jobs earn approximately 30 percent more than comparable professionals in non-STEM occupations. The partnership forged by the Triangle Women in STEM is aimed at recruiting, engaging and advancing women in STEM in the Triangle by building a community of women and a pipeline of girls aiming for STEM careers. By bringing together the girls and the professionals, they are showing how possibility can become a reality.